A culturally rich and vibrant country, Mexico is home to over 120 million people and is well known for its popular cuisine, fascinating historical sites from ancient civilizations like Mayans and Aztecs, beautiful natural locations, vibrant festivals and special events, and welcoming, friendly people. The music of Mexico is a big part of the country’s heritage and culture, with many Mexicans loving to move and dance to the music of their nation. Ask almost anyone for their view of music in Mexico, and their mind will inevitably be drawn to the classic image of those traditional Mariachi 'charro' costumes and matching sombreros, complete with silver linings and all kinds of colors. The Mariachi band is an iconic symbol that many people all over the world associate with the nation of Mexico as commonly as tequila and tacos, and with good reason: Mariachi music is one of the dominant styles in the nation and is an integral part of Mexican culture. Mariachi was even classed as a part of 'Intangible Cultural Heritage of Humanity' by UNESCO back in 2011 due to its fascinating and powerful messages. Mariachi music is associated with festivals, birthdays, and other happy occasions or special events, with songs like Las Mañanitas, La Bamba, and La Cucaracha being the most commonly known tunes associated with this style of music. The word 'Mariachi' has mysterious origins. Some argue that it came from the French word 'mariage' (meaning marriage, in English), due to the fact that this type of music was traditionally played on the big day for a bride and groom, but others argue that the word was passed down from native languages like Coca and Nahuatl and refers to the wooden platform on which the musicians traditionally performed. 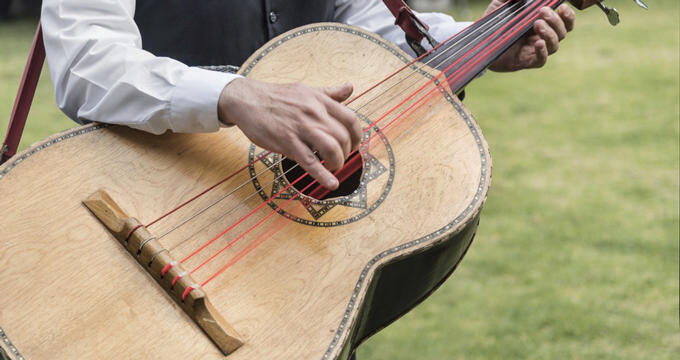 Regardless of its origin, the word has taken on special meanings over the years and is now simply used to describe a band of five or more musicians using traditional instruments like guitars, violins, trumpets, guitarrón, and vihuela, while dressed in the classic charro suit. These were originally the outfits of Mexican cowboys, distinctly decorated with embroidery and flashy buttons, as well as the traditional sombreros. Mariachi music is one of the most ubiquitous types of music in Mexico and can be heard in towns and cities all around the nation. Whenever a special event or festival is occurring, a Mariachi band is sure to be in attendance, and it's not uncommon to spot them in various plazas around the country like the famous Plaza de los Mariachis in Guadalajara. As well as the traditional folk and fiesta songs of the Mariachi bands, many other kinds of music can be enjoyed all around Mexico. In modern times, it's not uncommon to hear American-influenced styles of music like pop and rap, but each artist and band tends to retain a distinctly Mexican sound, taking inspiration from the nation's heritage and special culture to convey messages and meanings in each song that hold true significance for Mexican people. Norteno music is another very popular type of Mexican music. You might also know this genre under the name 'Grupero' and it refers to bands that use an accordion as well as a bajo sexto, which is a guitar with twelve strings. Other instruments may be included, but the accordion and bajo sexto are a key part of the Norteno experience. This style of Mexican music originated back in the late 1800s and early 1900s as new waves of migrants arrived and mixed together traditional Mexican sounds with the European styles they were used to. Norteno music is fast and easy to dance to and has expanded into various subgenres over the years. The final major style of Mexican music that everyone needs to know about is Ranchera. Commonly compared to the country genre in the US, Ranchera music is all about patriotic themes, relationships, and families. Each song tells tales of regular life and people in Mexico, with romantic themes and ideas that really help to set it apart from other styles. Taking cues from classic folk songs, this style of music also involves instruments like guitars, violins, trumpets, vihuelas, harps, harmonicas, accordions, and more.